AN EXPERIENCED hairdresser, who developed her skills as an apprentice at one of Cleethorpes’ most famous salons and barbers is using her knowledge to help others enter the profession. Leila, 46, of Scartho, joined the organisation, based within Pearl Assurance House in the town centre, after a background of 13-years’ teaching in the hairdressing and barbering sector. She is also a Master Colour Expert with Wella, which involved intense training and is one of very few to achieve this status in the area. In addition to Wella, Leila has also undertaken master-classes with leading brands, including Wahl and the Francesco Group. Before that, her hairdressing skills were learnt at the premises of Eric H Wakefield on Grimsby Road, where she started straight from school and spent the first 17 years of her career. “What a great experience that was, I really enjoyed my time there, working mainly within the barber’s side of the business – however I do remember that bubble perms were all the rage at that time, it was 1988 after all,” remembered Leila. At that time the business was booming, with customers queuing down the street from 8.30am, before the salon and barbers opened, she said. “It was an extremely busy salon, where you made friends for life,” said Leila. The shop was owned by the well-known Eric Wakefield whose son Alan was founder of the training organisation Alcrest – which built up a reputation across North East Lincolnshire for the training of apprentices, with hairdressing being a major part of the business. “I remember when I started as an apprentice, on twenty-eight pounds fifty a week, there would be about five of us beginning every year, with around 20 people working there. And it is funny what you learn later – it was only when I married my husband Jon-Paul that I found out my mother-in-law had also worked there,” said Leila. For Leila, her appointment at Avant Partnership is also a reminder of her time training as an apprentice with Alcrest at Eric H Wakefield. For when Alan retired from Alcrest it was Avant that took over delivery of their Apprenticeship Training. Leila now works with young apprentices of no more than six in a group, providing classroom-based training one day a week while supporting the young people in their workplaces. The Apprentices also undertake studies in Maths and English at Avant – meaning they do not have to have achieved A to C grades in those subjects at school. “For me the best training that you can have is when you are in the workplace, I don’t think there is anything you can compare it to. The salons with which we work are of very good quality, with extremely experienced staff who – along with Avant – tutor in, not only the skills of the trade, but also in how to behave professionally and how to communicate with clients,” explained Leila. 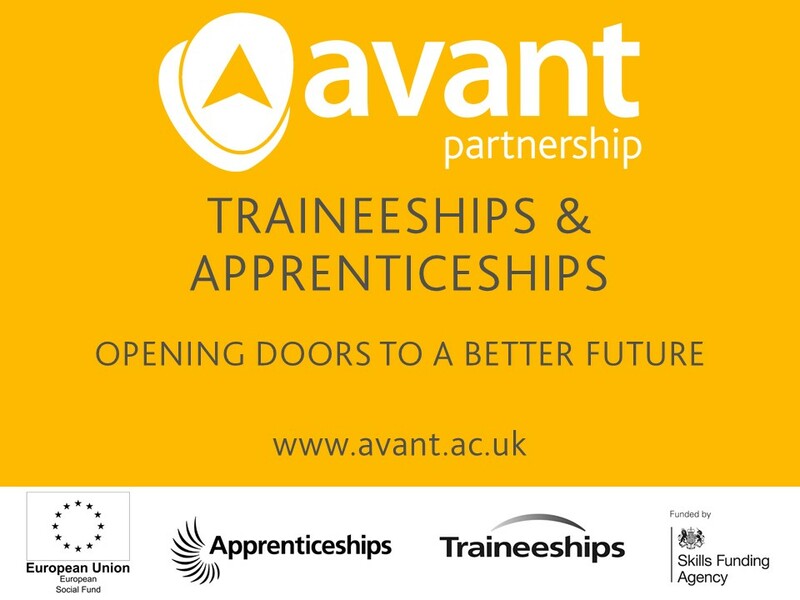 Avant offers Apprenticeships in hairdressing and barbering, customer service and business administration – liaising with a wide range of employers across North East Lincolnshire. They also deliver a Traineeship programme, for young people who are not quite ready for an Apprenticeship.